Rightio, that is us for the evening. Congratulations England for the clean sweep. Well done France for making sure they got their hands dirty to get it. Eddie Jones finishes up his media duties by saying that if England win it again next year, that will be a real achievement. Hard man to please. But I'm looking forward to 2017 already. "It is not all going to go swimmingly"
"I think boys and coaches have been harsh on themselves saying they haven’t played well, they are underestimating France. Never underestimate how important having this experience under belt. It is going to important because you can call on it. It is not all going to go swimmingly, there will be adversity but it is great to have in the bank." England's Billy Vunipola says: "This means a great deal. It's such a great bunch of guys and we've had a great eight weeks. "No-one can forget the World Cup but this is a great achievement and I'm so happy at the moment. "We came here and knew the crowd and the French players did not want us to win the Grand Slam on their home turf but we stood up to them and eventually came out on top." "I am delighted for Dylan not withstanding fact he took a heavy knock, not just this moment but to be a Grand Slam winning captain. He thought his England days were over, he is now going to stand on this stage as a Grand Slam champion." England's Owen Farrell tells BBC One: "It's brilliant. We set ourselves a goal to be the most dominant team in Europe and we've achieved that. It was not the best of starts for us even though we were up but we showed some character in the second half - the boys were brilliant. "We were focused on our job, the right messages were being said out there, France are a good team, especially over here but the boys weathered it well. "This squad has been brilliant since we met up at the start of the Six Nations. We built on our performances and got what we deserved. I'm just chuffed for the boys, we have a few that have been through a lot and some people that have come in." "It is a tough way to win it for England because they had three away games and this is notoriously very difficult for England to come and win in Paris, and with all expectation, all media pressure, all us old pros. "This is really what the old pros want, to see the future of game experience the incredible highs of success that we had. These are special moments for us. It is emotional and a fantastic achievement for the boys and I truly believe it could be the first step on a great journey on the next three of four years." "Eddie Jones will be the proudest Australian in the United Kingdom, he has inspired this team." 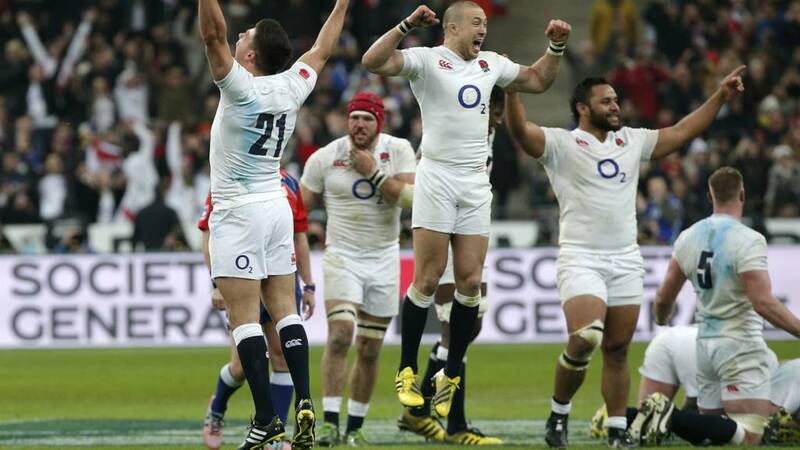 England boss Eddie Jones tells BBC One: "I'm very proud of the boys. We were not at our best but we battled throughout and deserve the victory. "It's a great achievement by the team. I always had confidence in the team. "The great thing is the best is ahead of us. We're looking forward to Australia and we're only going to get better." "Eddie Jones has inspired his team and that's what coaches are they to do. He has come in with a gameplan and brought in a captain and that has worked. "The pain of missing out in the past will be put to bed and they are only going to get better - I don't see this team getting worse. "I've enjoyed the tournament, it has been wonderful." England hoist the trophy to the backing of some ecstatic Europop at eardrum-bashing volume and some fast emptying Stade de France stands. The squad don't mind. They are in a bubble of their own and soon covered in bubbles from the bottles set aside for them as well. England's players are being called up to the presentation platform by a French stadium announcer who is pleased to get to Mike Brown after wrestling a little unconvincingly with the likes of Billy Vunipola and George Kruis' names. Bill Beaumont is up there to show a friendly face to his modern successors. "Of course we can say most important thing is Dylan Hartley is out there healthy but for him the most important thing is to be out there to lift trophy. "It shows any team that wins a Grand Slam they will be out there hugging and cheering but what incredible journey these players been through. I am chuffed to bits for them." "There's a lot more to come and lots of areas to improve on and Eddie Jones knows that. But this shows a lot of potential. "Let's not forget Stuart Lancaster, he must be sitting at home and thinking 'what if' as he identified many of these players that are playing here." Dylan Hartley is back out with his team-mates as they huddle up with their support staff. He looks a little woozy, but great to see him back on his feet and ready to get his rewards for leading England to a Grand Slam. Owen Farrell is "chuffed". Billy Vunipola is "blessed". More and more interesting quotes to come. England's players disappear into a flurry of bearhugs and backslaps. Coach Eddie Jones is on his way down to join in. Possibly. First he has got to make his way through a stairway of indifferent Frenchman and a round of media questions. The head honcho admits that England were "not at their best today" and immediately throws forward to the summer tour of Australia. "Make no bones about it this is a real decent performance against a French side who have given their best performance in this Six Nations. Also we are in Paris not Twickenham when you get carried away with euphoria. England have travelled and won the Grand slam away from home." Ben Youngs hoofs the ball into the stands! England's Grand Slam is complete. "It is through, England have won the Grand Slam. There is no time left for France to come back"
"People will say it has been a poor championship, but Grand Slams are never easily won and are always worth something." Owen Farrell dispatches the kick and Nigel Owens dispatches France's Xavier Chiocci to the bin for pulling down the line-out and giving away the penalty. That is the Grand Slam sealed.